Meredith Newman ’09 likes to be in life’s driver’s seat, even if the road occasionally takes an unexpected turn. After two years as an assistant women’s lacrosse coach at Kenyon College she was actively looking for opportunities in nationally ranked Division III programs or maybe a Division I school. She’d been successful coordinating Kenyon’s offense, helping the team advance to a first-time NCAA tournament berth and nearly double scoring and assists her first year. Then Beloit College in Wisconsin called her — a Division III school that didn’t have a lacrosse program. 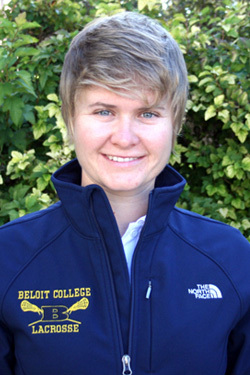 In August, at age 24, she became the first head coach of the Beloit Buccaneers women’s lacrosse team. “My reaction was, ‘OK, that’s a big jump,” she says. Being responsible for founding a new program wasn’t expected, but she is embracing it just as she did a former colleague’s suggestion that led her to coaching in the first place. “I always knew I wanted to make an impact somehow. I just wasn’t sure how. Being a lacrosse coach really provides that outlet for me,” Newman says of working with college students. Of course, she is counting on her players to help make the program successful, especially once they play their first season next year. “We’re bringing students in who are driven and passionate and who understand we’re going to build this thing together,” she says. Newman’s love of lacrosse goes back a long way. In the seventh grade she was part of a start-up program at Tandem Friends School in Charlottesville, where she grew up. Still, she never considered coaching, despite playing four years at Sweet Briar wearing the No. 19 jersey and spending her last two as a team co-captain. She scored more than 160 points in her career and was among conference leaders in points, goals and assists her junior year. A competitive rider since age 6, she thought she might train and sell horses. The summer before her junior year, she tried the business while working at a family-run horse farm in the Netherlands. She brought two horses, Elvis Presley and Buddy Holly, home with her to Sweet Briar. “Those two were my first and last investment horses, mainly for the reason that I found it difficult to part with them and did not want to live my life at odds with my livelihood,” says Newman, who earned her degree in sociology with an engineering minor. “[Horses were] a way of life for me. It wasn’t until I went to Sweet Briar and was able to continue riding in addition to my other endeavors, that I realized all the wonderful things I learned in riding could be applied elsewhere,” she said. Newman has found Beloit (home of the famous Mindset List, published annually since 1998 to reflect the world view of entering first-years) offers students a similarly balanced experience. Like Sweet Briar, it is a small liberal arts college, where she says faculty and staff work together to foster students’ individual growth in and out of the classroom and on the playing field.